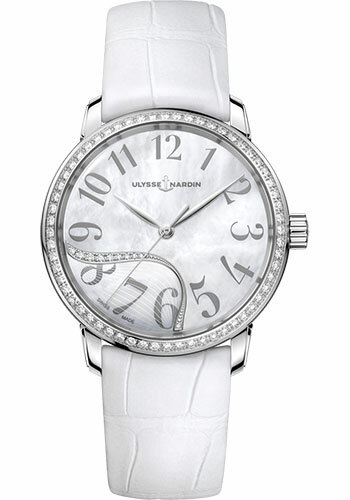 37 mm stainless steel case, sapphire crystal, white mother of pearl dial, Caliber UN-815 self-winding movement with Ulysse Nardin performance certificate, leather strap, folding buckle. Water resistant to 30m. 34 mm stainless steel case, sapphire crystal, white mother of pearl dial, Caliber UN-815 self-winding movement with Ulysse Nardin performance certificate, leather strap, folding buckle. Water resistant to 30m. 34 mm stainless steel case, sapphire crystal, white mother of pearl dial, Caliber UN-815 self-winding movement with Ulysse Nardin performance certificate, leather strap, folding buckle.